What a journey this has been. Learning and working with these 2 amazing animals has been life changing for us. We attended the wonderful training courses at the Donkey Sanctuary in Sidmouth and learned how to look after and train our donkeys. Eternal thanks to Ben Hart. The donkeys have learned how to walk on a lead rope and (hopefully) not stop every 2 minutes to graze. They have learned to be calm around people and traffic, and above all to trust us. We have worked hard to develop their confidence and problem solving abilities using exercises we learned at the Donkey Sanctuary. 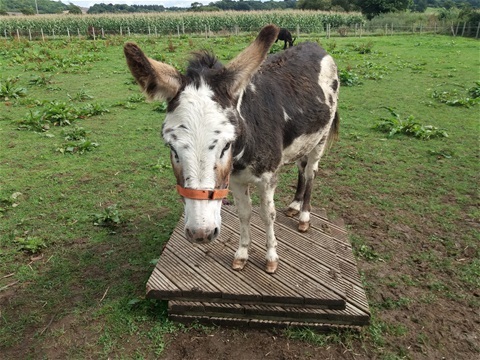 The photo shows Chewy feeling proud that he has learned to stand on a pile of decking, which is helpful in teaching donkeys to walk on different surfaces and to climb stairs. Then there is the farrier. Donkey feet need trimming every 12 weeks or so. Then the Dentist to make sure their teeth are good. They have both learned to carry panniers so we dont have to carry our own picnics! Chewy went to church twice at Christmas. Wit stayed at home because after a promising start he is no longer a fan of getting in the trailer. We are working on that one! Our donkeys spent the winter in the barn to ensure that their feet did not suffer from the wet pasture at the Rowdey Cow. They still enjoyed regular walks and plenty of attention from visitors.